Ben Wyatt is the father of Allison Wyatt. Benjamin "Ben" Wyatt is a character in the TV series above. 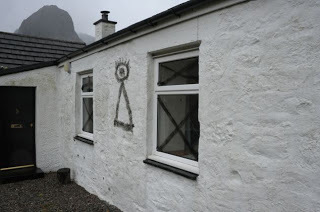 Above is Jimmy Savile's Glencoe "lair", note graffiti. Anonymous referred us to Saul Alinsky. Biographer Sanford Horwitt has claimed that Barack Obama's 2008 presidential campaign was influenced by Alinsky's teachings. "There was one thing about Alinsky that really bothered me: he preached the ends justified the means. "In a way, he was the Ayn Rand of the socialist movement. "When I saw Obama and Hillary both track back to Alinksy organizations, it really makes me wonder if he wasn’t operating on another level, dancing through raindrops, just another spook on a secret mission with a hidden agenda. The University of Chicago's Leo Strauss. "Alinksy was a poor Russian Jew in Chicago when he unexpectedly got offered a fellowship at the University of Chicago to study criminology, and since he had zero background in that field, one wonders how he landed such a cushy deal? "I guess you know the University of Chicago was created by the Rockefeller Trust, and also birthed the warmongering neo-conservative movement that fomented wars in Iraq and Afghanistan that bankrupted the nation. "Right after getting that fellowship, Alinksy spent two years hanging out with the Al Capone gang, then being run by Frank Nitti, as Al had income tax problems to deal with. "Alinksy was allowed complete access to the gang, including its financial secrets." Alinsky wrote 12 Rules for Radicals. So, how might Alinsky's 'rules' help Obama and the Chicago Mafia? With reference to Strauss / Kotb video, there is some more information in that area which is relevant and non-conspiracy. Strauss had an impact on Neo-con politics, but a real analysis will show gaps. The underlying political driving force, applicable to the so called 'New World Order', is somewhat different. Relevant to this blog, and not discussed so much considering it's content, is the simple observation that the 'family' has been and is under attack by the state. Paedophilia is part of this, the enabling factors though, outside of black ops, do not appear to make much sense. ie. Why does the state actively break families up these days, in particular segregating fathers from their children, and placing children into state care which exposes them to abuse ? Monarch / MK-Ultra notions are relevant, but there is a more fundamental aspect which has deep roots in psychology and sociological theory. For this: Frankfurt School, Theodor W. Adorno is relevant. It argued that the willingness of the masses to follow the fascist dictators of Europe was rooted in the structure of the traditional family itself. His solution: Break up the traditional family. For all the incredible ideas concerning thought control and mind programming of children, this brutal act of the state is the easiest way to forever change them. According to Adorno, when those children reach adulthood they will be unlikely to follow a strong charismatic leader. This is of course abhorrent and incorrect, but a reflection on where society is now reveals how it has been implemented. Consider carefully the full picture. A final note on this is regarding liberalism. The amoral version of liberalism which allowed the likes of Savile and others documented on this blog to become active is a perversion of what liberalism should be. It should not be confused with libertarianism which retains moral consequence as a core foundation. One reason for conflict between the West and so called 'Islamism' is the simple fact that those opposed to the West do not wish to have their moral code denied by imposed western liberalism. In this sense, western liberalism can be regarded as being a highly passive aggressive ideology. For 9/11: Operation Northwoods has recently come to light. Anyone who has been tracking the transponder irregularities will understand the relevance. Fails credibility tests, but is enough to spook. - Think about that one carefully. The other rules are worth working through ad thinking about: You will understand how certain broadcast interviews are put together. Forewarned is forearmed: And most of these techniques can be reversed if necessary to get a desirable result. so there is no picture of Allison Wyatt or Allison Whatt that can be relied on? Why so many kids into care? Breaking up the social structure is one part of it. Don't forget zionist strategy has always been small increments of change, always one step to far then a step back. Rothy and Rocky are homosexual and want a society where that, homosexual marriage and raising children is considered normal. Destroying the fabric of society also goes back to Weishaupt and the Protocols road map derived from his ideal of a world order run by self-appointed elites.